During the First World War, several countries started to make propaganda films. 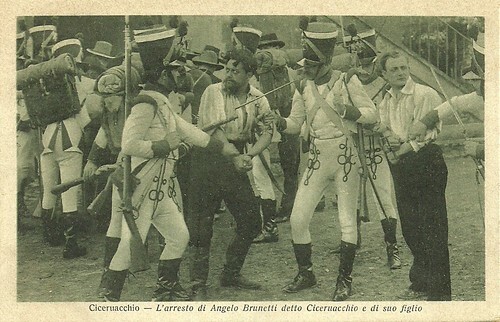 In Italy, Tiber Film produced the historical propaganda film Ciceruacchio (Emilio Ghione, 1915). Italian postcard for Ciceruacchio (Emilio Ghione, 1915). Photo: Tiber Film. Caption: Among the turmoil of political passions and among the whispers of a heart overwhelmed by the idea of the Fatherland, he then passed his life. 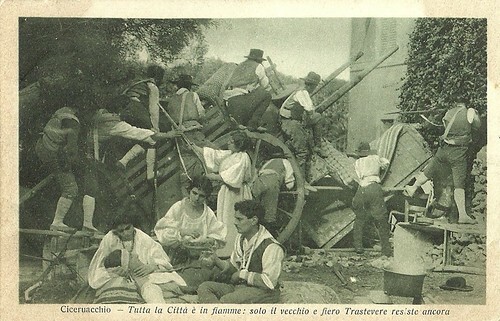 Italian postcard for Ciceruacchio (Emilio Ghione, 1915). Photo: Tiber Film. Caption: The opulent Papal Court. 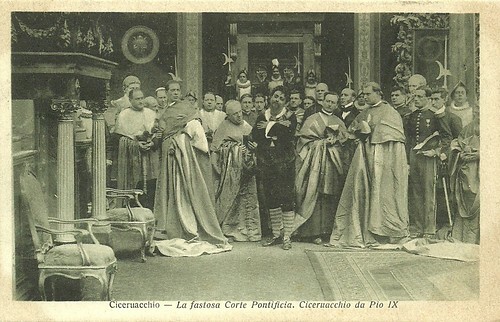 Ciceruacchio (Gastone Monaldi) with Pius IX. 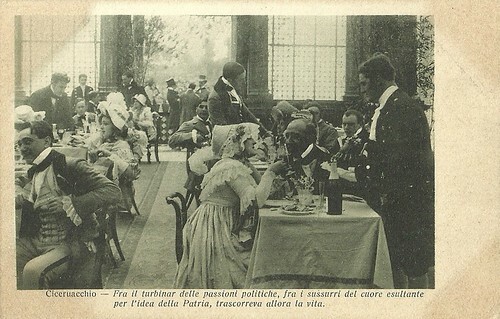 Italian postcard for Ciceruacchio (Emilio Ghione, 1915). Photo: Tiber Film. Caption: A sweet dream that became even sweeter reality. Ciceruacchio/Martire del piombo austriaco (Martyr of Austrian bullets, 1915) was an Italian historical film by Emilio Ghione, dealing with victims of the Austrian occupation of Italy. The film was intended to raise anti-Austrians sentiment during the First World War when the Northwest part of Italy - the present province of Friuli - was still under Austrian occupation. Ciceruacchio passed censorship on 22 June 1915, while a week earlier, on 18 June 1915, the film had its first night in Rome. Reputed stage actor Gastone Monaldi, famous for his dialect acting, played the lead of Ciceruacchio, and his partner Fernanda Battiferri played Annetta. Alberto Collo played their son. Ida Carloni Talli played as usual the mother, Brunetti’s mother in this case. Angelo Brunetti, named Ciceruacchio, a Roman trader in cheese and wine, was much beloved by the Roman people, e.g. for his behaviour during the 1837 cholera plague. In a public performance in 1846 he thanked the pope Pius IX for releasing political prisoners, while in 1847 he pressed Pius IX to continue his policy of reform. During the 1848 revolution he joined the Roman Republican forces and helped the Romans in the siege by the French. But when they were defeated in 1849, he fled with his sons Lorenzo and Luigi and hoped with Garibaldi and allies to liberate Venice from the Austrians. Instead they were betrayed by locals at Cesenatico and then arrested and executed by the Austrians on 10 August 1849. Italian postcard for Ciceruacchio (Emilio Ghione, 1915). Photo: Tiber Film. Caption: People of Rome! Do you want to bend to slavery by the stranger? No! Do you want to swear with me to die for freedom? Yes! Yes! 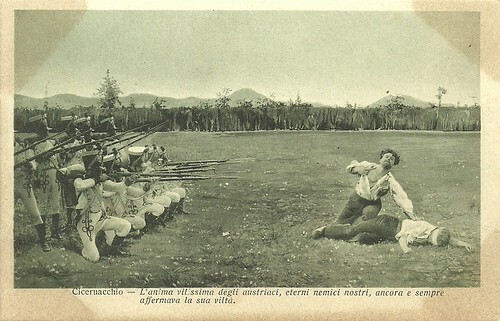 Italian postcard for Ciceruacchio (Emilio Ghione, 1915). Photo: Tiber Film. Caption: The whole city is on fire; only the old and proud Trastevere still resists. Emilio Ghione was a regular actor for Cines, Celio and Caesar in Rome, before he started to direct films in 1914. For a long time he was most remembered for his Za-la-Mort crime films at Tiber Film, in which he had the lead too. At Tiber he also made various - commissioned - historical propaganda films during the First World War, such as Oberdan (1915) starring Alberto Collo, and Ciceruacchio (1915). 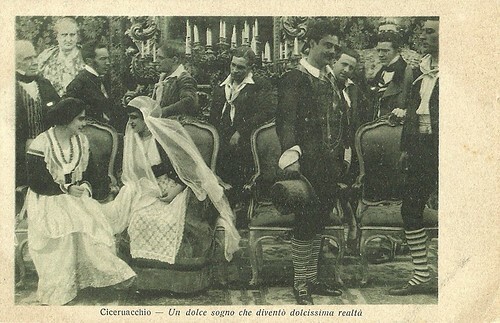 Ciceruacchio (1915) was scripted by Emilio Calve. The plot mostly follows history. The papal police suspects Brunetti, aka Ciceruacchio (meaning little fat man), but when Pius IX hears about Brunetti's bravery during a flood, he gives him a special audience. Brunetti henceforth considers the pope Rome's saviour, while his republican friends think otherwise. When the pope flees to Gaeta during the revolution, leaving the city to foreign oppressors, Cicueracchio becomes Rome's new leader, but he has to flee after the last stronghold, Trastevere, is conquered. He is betrayed and arrested in Rovigo, and executed with his son Luigi (Alberto Collo). In the film, Ghione suggests Brunetti was killed with only his eldest son, while in reality both sons and also several allies of Brunetti were killed with them. Later, the story of Ciceruacchio would be filmed again in In nome del popolo sovrano (1990) by Luigi Magni, in which Nino Manfredi performed Brunetti. Ciceruacchio was also recreated in Camicie rosse (1952) by Goffredo Alesandrini and Francesco Rosi and returned in the recent mini-series Anita Garibaldi (2012). 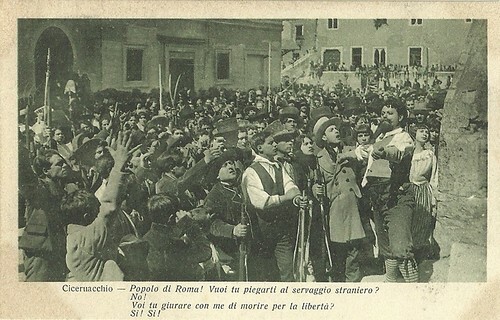 Italian postcard for Ciceruacchio (Emilio Ghione, 1915). Photo: Tiber Film. Caption: The arrest of Angelo Brunetti named Ciceruacchio and his son. Gastone Monaldi as Cicueracchio and Alberto Collo as his son Luigi. Italian postcard for Ciceruacchio (Emilio Ghione, 1915). Photo: Tiber Film. Caption: The most coward spirit of the Austrians, our eternal enemies, like always and still does confirm its cowardice. Source: Denis Lotti (Emilio Ghione. L’ ultimo apache - Italian), Wikipedia (Italian) and IMDb.